The British Library is the National Library of the United Kingdom. It is one of the largest public libraries in the world with nearly 200 million items growing at a rate of over 8000 items a day. The collection consists of one of every book published in the U.K. along with collections donated by Robert Cotton, Joseph Banks, Thomas Grenville, Hang Sloan and also the King's Library of King George III. 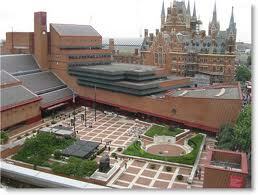 The British Library was originally part of the British Museum officially created as an institution in 1972. Previously housed in 9 or 10 separate buildings, it was not until 1997 that the construction of a new building was started, designed by ..., and created to look like an ocean liner, was officially opened in 1998. The underground storage facility included, the structure is equivalent to an eight story building. The library has an automated system for bringing items from the basement to the reading room. The website for The British Museum is http://www.bl.uk/.